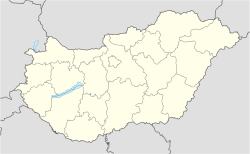 Veszprém (Hungarian pronunciation: [ˈvɛspreːm]; German: Weißbrunn, Slovenie: Belomost) is ane o the auldest urban auries in Hungary, an a ceety wi coonty richts. It lies approximately 15 km (9 mi) north o the Lake Balaton. It is the admeenistrative centre o the coonty (comitatus or 'megye') o the same name.